These Chocolate Chip Cookie Cupcakes are some serious cupcakes, y’all. But that’s kind of a lie. They’re not really cupcakes. They’re cookies. Giant chocolate chip cookies. 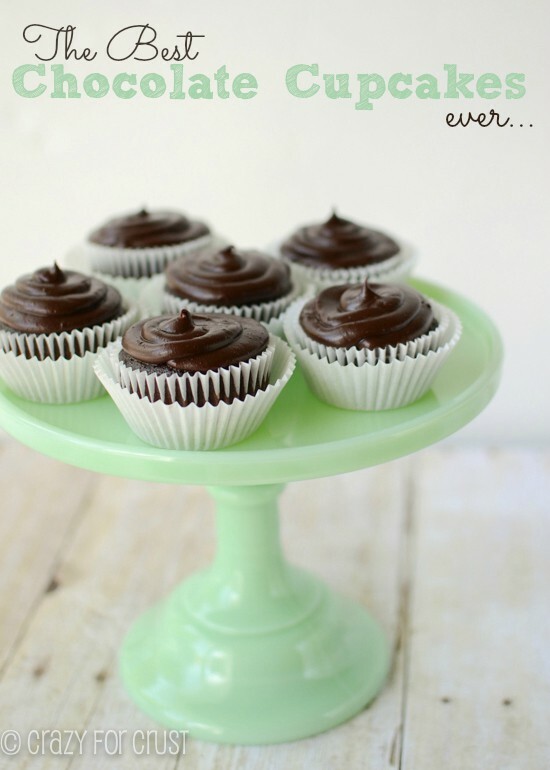 With brown butter chocolate frosting. And a cookie garnish. Like I said…serious with a capital OMG. You guys. Before we start talking about these chocolate chip cookie cupcakes that are really the best chocolate chip cookie masquerading as a cupcake, let’s talk about babies. I love babies. Other peoples’, that is. And you know what? It’s raining babies around blog land! A few weeks ago some friends and I threw Lisa a baby shower. Now, it’s Cathy’s turn! Cathy is the amazing mom and blogger behind Lemon Tree Dwelling. If you’ve never visited her blog, go. Run. Her food is amazing! She posts things like S’mores Cheesecake Cups and Lemon Bar Muddy Buddies. And she posts real food too, like dinners and salads and stuff which is great because then there’s room for more quick bread. 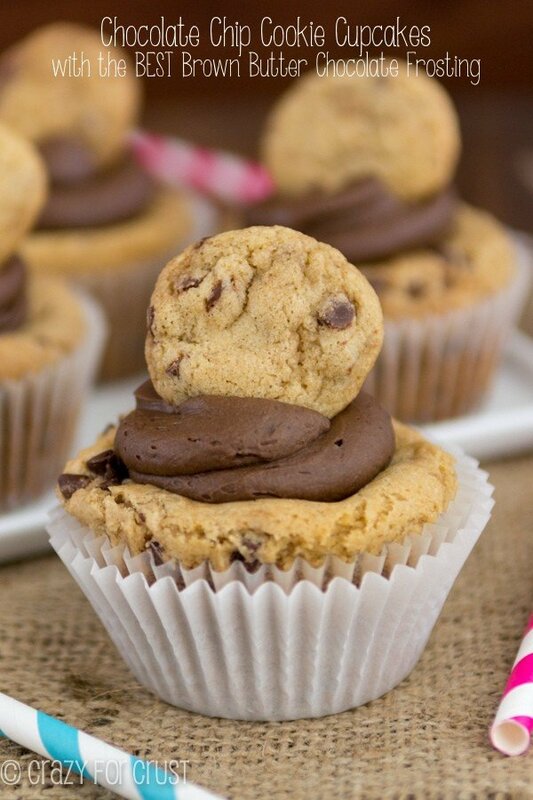 I’m bringing cookie cupcakes to her shower, because I needed an excuse to make these Chocolate Chip Cookie Cupcakes. Scratch that. I don’t need an excuse to make them, I need an excuse to eat 6. Now, if you’ve read this blog for any length of time, you’ll have seen (and maybe pinned?) my XL Bakery-Style Chocolate Chip Cookie recipe. I think it’s one of my absolute favorite recipes on this site, and I’ve always gotten amazing reviews on it. One reader actually tweeted me awhile back and said they liked it as much as they liked Alton Brown’s recipe, which made me laugh, blush, and spit coffee across the room. I wanted to make cupcakes but I wasn’t in the mood for cake. I also wasn’t in the mood for waiting – and that chocolate chip cookie recipe requires overnight chilling. These do not. Oh, they require chilling, but it doesn’t have to be overnight (the flavors will be bolder if you do wait, but you don’t have to). When I made these cookie cupcakes, I was expecting the cookie to be the star. It’s not. The frosting is the star of these Chocolate Chip Cookie Cupcakes. The frosting is the best chocolate frosting I’ve ever had. Both the cookies and the frosting start with something amazing: brown butter. Now, if you’re not a foodie and don’t read a lot of blogs, you might not know what that is or how to do it. It’s really way easier than it sounds. Brown (or browned) butter is basically butter that’s been melted and cooked. When you cook butter at a consistent heat for a period of time, it changes from it’s regular color to a deep, dark brown. And the color isn’t the only thing that changes: the flavor is unbelievable. Brown butter has a nuttier, more rich butter flavor. It’s hard to describe, so you’ll just have to believe me, but adding brown butter in place of regular melted butter adds a depth to your recipe that you wouldn’t believe. All you have to do is add your butter to a pan (I like to slice it up first, so that it melts faster and more evenly) and cook it over medium-low heat. You don’t have to stir it constantly, just occasionally. You don’t have to stare at it constantly, but don’t leave the kitchen. The butter will melt, then it will foam. Then the foam will reduce, then it will foam again. Then it will start to brown. Like when you’re making pudding or some thickening sauce, once it starts to brown it browns fast. At that point you want to be watching it. Too brown makes it burned. Burned butter is not good. Once it’s browned, you use it as directed in whatever recipe you’re making. (Like say…chocolate chip cookies…or frosting.) There will be some sediment on the bottom of your pan; that’s normal. What makes this brown butter chocolate frosting the best frosting ever? The fact that I browned the butter, then chilled it until it solidified (but was still soft enough to mix). This amps up the flavor of the frosting x1000. Then I added chocolate. And I died and went to heaven. The Chocolate Chip Cookie Cupcakes are made with browned butter too, as well as a combination of vanilla and almond extract. You don’t have to use the almond extract, but you’ll be amazed at the flavor it adds. 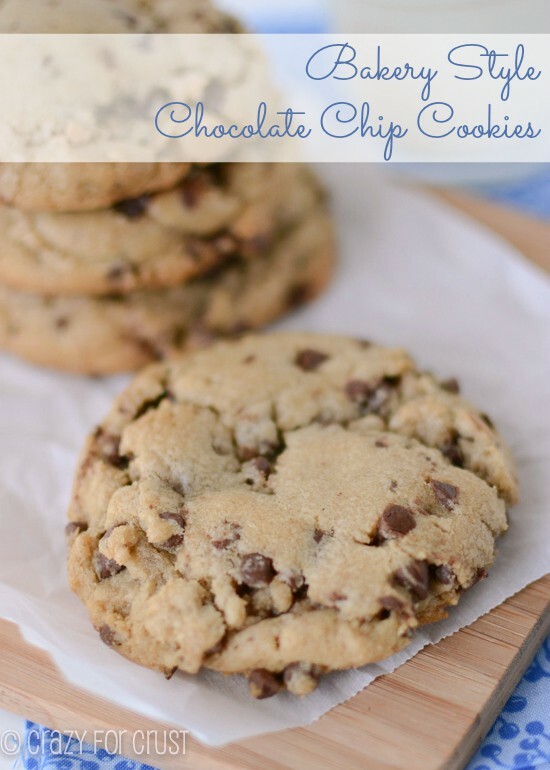 I use mini chocolate chips in this recipe because I think it spreads the chocolate more evenly throughout the cookie. You can use regular chocolate chips, but I’m in love with the minis. I use them in almost everything these days! Nestle is the most common maker of the mini chocolate chips, but I’ve also seen them by Guittard. I wanted to make a cookie garnish for the top of these, but you can skip that and make an extra cookie cupcake or two, your choice. Each of these cookies uses 1/4 cup of dough – so I wasn’t exaggerating when I said they’re a serious cupcake. If you’re worried about how big they are, you could make these in a mini muffin pan instead, just watch the baking time. Whatever you do, don’t skip the frosting on these Chocolate Chip Cookie Cupcakes. I want to make the frosting again just so I can eat it with a spoon. Seriously – best frosting ever. 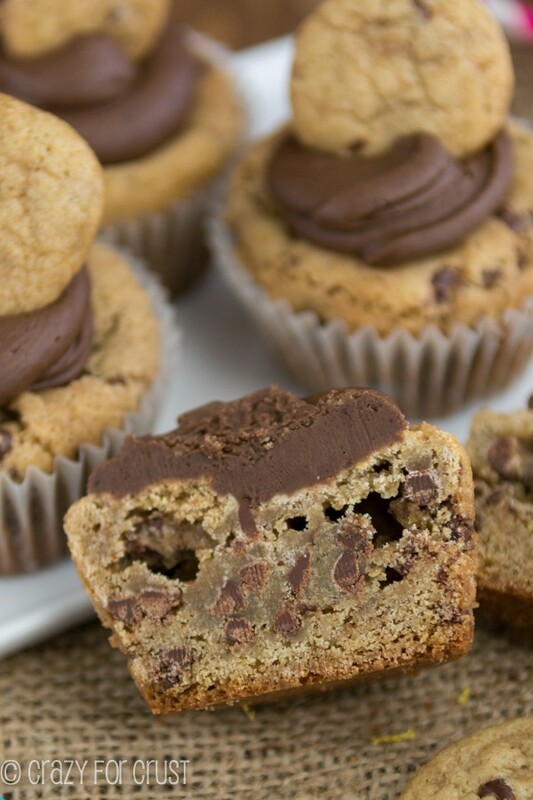 These Chocolate Chip Cookie Cupcakes are perfect for any party. Or because you’re so craving chocolate chip cookies! 2 sticks butter — we’re going to brown it! Melt butter in a saucepan over medium heat. Cook, stirring often, about 6 minutes, until it becomes brown in color. It will foam, reduce, then foam again. Once it’s done cooking the foam is a light brown and it will dissipate after you remove it from the heat. Once it starts to brown, keep stirring so it doesn’t burn. Let sit for about 5 minutes to cool. Turn mixer (with butter mixture bowl attached) on low. Add eggs, one at a time, mixing completely. Mix in vanilla extract and almond extract (optional, but it adds great flavor). Add flour mixture to the wet ingredients and mix until combined. Stir in chocolate chips. Line cupcake pans with 15 liners and one baking sheet with parchment or a silpat baking mat. Scoop out 15 balls of cookie dough that are about 1/4 cup each (I use an ice cream scoop for this). Place one ball in each cupcake liner. Divide the remaining dough into 1/2 tablespoon sized balls. 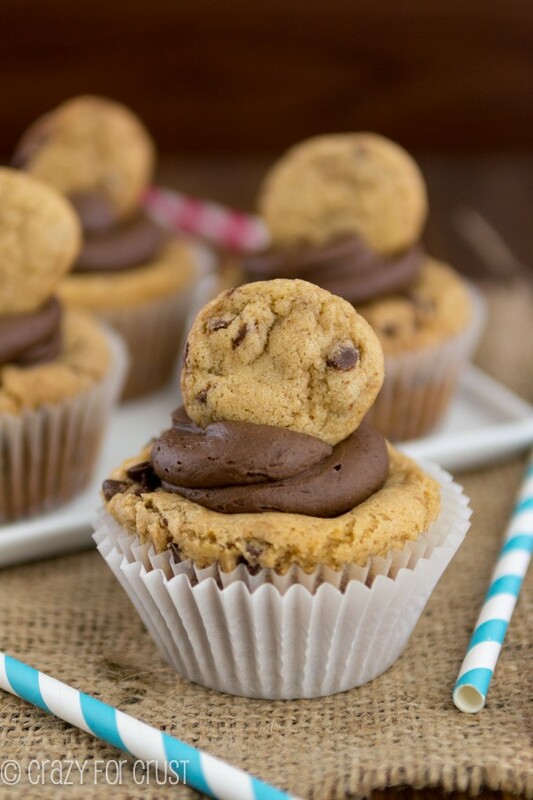 Chill both the cookie dough cupcakes and little cookie balls for at least 2 hours (or more). Before baking cookies, start the frosting (see below). Preheat oven to 350°F. Bake mini cookies for about 7-8 minutes. Bake the cupcakes for about 15-18 minutes. In both cases, the outside will start to turn a rich golden color. You don't want to over bake these, they taste best when they're a little under done in the middle. Cool the cupcakes for 15 minutes in the pan before removing to a rack to cool completely. Frost once cool. Once butter has set, mix in the powdered sugar and cocoa with a hand mixer until crumbly. Add vanilla and 2 tablespoons cream. Mix. Add more cream, 1 tablespoon at a time, until you’ve reached your desired spreading consistency. Check out all the other baby shower food – don’t you wish you were really at her shower??!! Oh man these look amazing! Pinning ASAP!! I have 2 questions….I don’t have a “stand” mixer….a lot of your recipes call for one. Will a hand mixer work ..or will I burn out the motor trying to make some of your recipes? (I’ve already burned out the motor on one.) Other question…. I don’t have a food processor, will a very old blender work? Thanks for your advice. You can use a hand mixer 90% of the time. For these cookies, yes you can. (For things like yeasted dough and some other things like that, you might only be able to use the hand mixer for some of it.) Obviously a stand mixer is more powerful (and faster) than a hand mixer so it’s going to last longer and be able to work harder. I can’t guarantee that your hand mixer motor won’t die – but it shouldn’t after making these cookies. If you use it a lot, then it will burn out, I’m sure. I do know that I had a Cuisinart Hand Mixer that I got 14 years ago, and it still works fine, but I got a new one (we food bloggers need doubles of pretty much everything) and the new one was 10x faster even though it’s the same exact one. Newer was better, and would do a better job. So in essence, yes you can use a hand mixer but just know it might take longer. These cookies are smooth when making the dough, so it wouldn’t be a problem, but if you’re making gooey bars or something, it’ll take quite a bit more time than a stand mixer. As for food processor vs. blender, that’s a tough one. All blenders are not created equal. You said it’s an old blender – is it a basic one or a Blendtex/Vitamix? If it’s a basic one…I’d say no unless you’re grinding oats or something. But if it’s a Blendtec or similar, it’ll do all of what a food processor can do. If you’re making pie crust, for example, no you can’t use a blender (either kind). Peanut butter could be made in a blendtec, but not a hamilton beach. It’s really about what you’re making. Dorothy, thank you so very much for your helpful and thoughtful reply to my questions. You have given me a lot of “food for thought”…(sorry just couldn’t resist saying that). But you really did! Pingback: Frozen Chocolate S’mores Ice Cream Pie. 3 Ingredients. 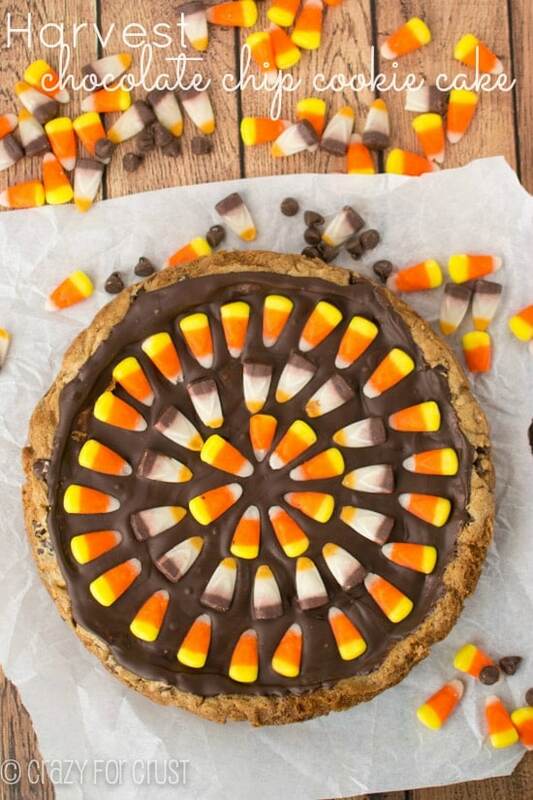 No Bake. 5 min. These look beautiful! How should they be stored how long will they keep? Thank you!